Eric Brown. The Wisdom of the Dead. 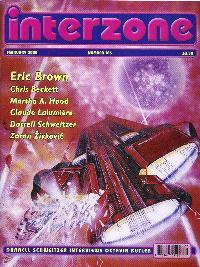 Interzone have published a number of stories in Brown’s ‘Kethani’ sequence. Here we are reunited with Richard – a Ferryman, who takes the bodies of the dead to the Kethani, who whisk the bodies back to their home planet, and resurrect them. Darrell Schweitzer. The Runners in the Maze. A dose of the shivering horrors. The narrator tells of his unfortunate childhood – saved from a shipwreck in which his family were drowned. However, rather than being penniless, he is taken in by a strange, far-removed relative. Lord Blessingleigh is the 14th of that ilk. At least, that is what he professes to be. But he is in league with dark forces, and the young boy is to be his route into becoming the 15th. Martha A. Hood. Just a Number. Longevity has its drawbacks, as any SF reader will be only too aware. Jed Munsen has been stuck in his Fifties for 18 years, and wants out of that age. His wife has no truck with this idea, and it does of course end in tears. An artist from the Metropolis visits the country, and indulges in rarified if uninspiring conversation with the parochial dilettantes and would-be artists. However, even in this setting, a veritable period piece in which one would expect the denoument to include Lady Bracknell gasping ‘A Handbag!’, lurks a darker side. Zoran Zivkovic. Alarm Clock on the Night Table. Another of the carefully crafted but otherwise uninspiring stories from Zivkovic. An elderly woman is able to revisit her youth, when her abruptness prevented a flowering passion from taking root, and sent her wooer to the Front, where, of course, gentle reader, he died. A young man dabbles a little with the occult, but leaves that behind for some years. Travelling in Europe, his virginal state is taken from him whilst asleep, by a slightly older man who he had seen previously. And that man had looked…. strangely familiar. The man leaves him with a bottle of liquid which, in later years, proves to be an elixir which makes it clear that he is possessed by the spirit of a creature of Cthulhian background. Story Poll Results for 2001 (yes, 2001!) – Ian Watson’s ‘Isabel of the Fall’ only 7th, and Di Filippo’s ‘Babylon Sisters’ only 18th! A collection of OK stories, with the Schweitzer story having the most going for it.